Consumers today do a ton of research online before making a purchasing decision. They read specs, compare prices, and – you guessed it – they read a lot of reviews and testimonials. Why? Because reading testimonials gives consumers an idea of how the product/service will work out for them (or not). This type of social proof is important because it tugs at the emotional strings of consumers; it puts the reader in the shoes of the reviewer. Start using customer testimonials and create an emotional connection with your customers. Sign up for Spectoos today. Each of these methods of using customer testimonials can help bolster social proof to website visitors and have the potential to sway leads into customers. Still not convinced? Why not try it out for yourself. 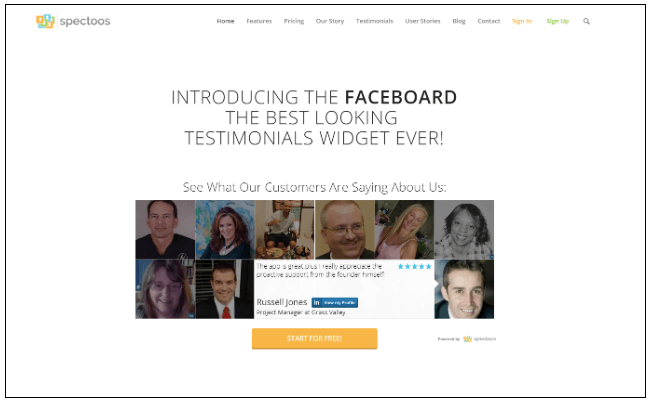 Add customer testimonials to your own site and watch your conversions sky-rocket. But, wait, before you do, there is something you need to know: many online customer testimonials are actually illegal. Before you disobey laws that you may not have even known existed, make sure you follow these tips to keep your customer testimonials legit and in line with the Federal Trade Commission’s truth in advertising laws. Because customer testimonials must reflect the user’s actual experience and opinions, you cannot “feed” your clients the reviews you would like them to leave. Also, all claims have to be provable. That is, if a customer says your product increased their sales 500% or made them lose 500 pounds in 5 days, they need the scientific proof to back it up. Just make sure that you (and your customers) do not include any misleading or unverifiable information in your review. The best way to show authenticity with your reviews is by using a customer testimonial platform, like Spectoos, that has real photos of the reviewers and links to their social media profiles. This helps to show they are real people — not computer generated avatars. In addition to the customer testimonial that claims results well above average, you may also want to offer survey results or studies that show average results of multiple customers. This is just one easy way to get customer testimonials that are authentic and help build trust with the brand. Often times, bloggers are paid money and/or given gifts to promote a product. If this is the case, the affiliation must be disclosed and the review cannot be published as unsolicited. It is a common trend today for brands to connect with influencers who have popular blogs or a lot of followers on social media. Brands will team up with these influencers to promote their products or services with reviews, testimonials, giveaways, and general mentions on their blogs or social media channels. It’s important to make sure any partnerships or affiliations are disclosed to the public. This infographic highlights a number of best practices influencers should use across social media channels when highlighting brand affiliations. Provide an easy way for your customers to provide their feedback (we recommend our social testimonials tools) and give permission to use their testimonial. Guide users about the kind of information you would like them to review, but not the content of the review itself. If customers experience results that are atypical, disclose that “individual results may vary” and/or include information about what kind of results are typical. Disclose any affiliations that may be viewed as skewing the testimonial such as paying for reviews or providing gifts. Test different reviews on your site to gauge which ones are most effective. Do you want to start using customer testimonials in your marketing strategy? If you’re looking for more effective ways to collect and manage testimonials for your brand give Spectoos a try, today.